In it’s latest release of DeRail Games, Shock and Awe changes the style completely from their previous two games which were bouncy ball games reviewed on this site. 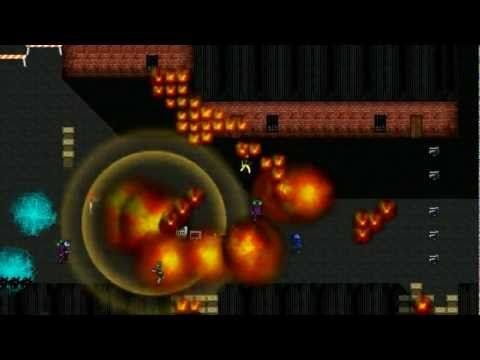 Shock and Awe is an alien shooter. Aliens have invaded, and you have to defeat them. This game plays across between Alien Breed and Smash TV. The controls are fairly simple, with both of the analog pads used – one used for shooting, the other is used for directing your character through the levels. The controls are pretty secure, I never had any problems with aiming, and unlike Smash TV the game has full 360-degree rotation, rather than 8 directions for shots, it does make the game fairer. There's often a lot going on on the screen. Before beginning the game, you pick one of 4 characters. 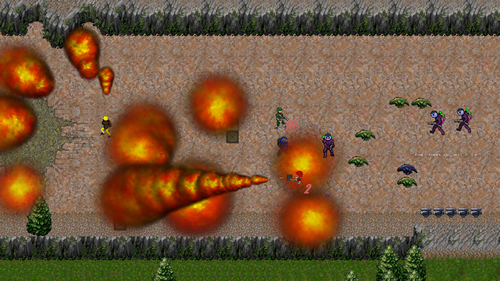 Each character has one of two different standard weapons (either a machine gun or a slower but more powerful shotgun), and a special attack which is unique to the character. These help you clear areas of enemies. You have 300 health points, and you can lose them at various, almost regular intervals. Yes this game is tough, incredibly tough, as you can pick up different weapons, the flamethrower and the freezer are two that are fairly common. The freezer can come in handy when you need to get across various fires which take up the screen. Everything seems to hurt you, and there doesn’t seem to be any pickups to help heal you. It’s a tough game. It’s enjoyable and a solid game, and for the price of 80 Microsoft Points it’s perfectly reasonable on Xbox Live Arcade. However on one player mode it is tough, on more than one players though, it is quite a fun distraction.